Odell Beckham Jr. struggled against the Cowboys in 2015. I haven't forgotten Odell Beckham's catch. 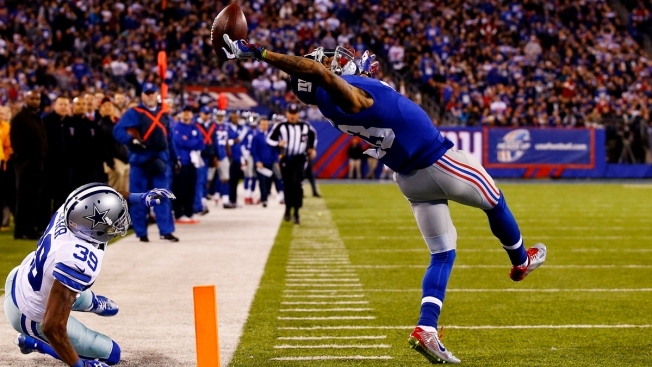 Beckham made the greatest catch of all time on Sunday Night Football against Brandon Carr and the Dallas Cowboys in 2014. I could give you details but again, you remember. As do the Cowboys. So in 2015, they weren't going to let the superstar wide receiver beat them. Last season, ODB's worst two games came at the hands of the Cowboys. Carr was the primary defender but he got a lot of safety help. Beckham caught a total of nine balls for 79 yards and no touchdowns during the Cowboys in 2015. Those numbers are quite different then what he did in 2014 against Dallas. By comparison, he grabbed 14 balls for 180 yards and four touchdowns during the two games. If you're looking for an extra layer of intrigue during the Cowboys, Giants season opener, pay attention to how New York uses Beckham. He's a volume wide receiver and his presence alone puts a lot of stress on the defense. Newy: Could Cowboys Draft DT Jeffery Simmons? As oppossed ot 2015, OBD will have more help around him. Victor Cruz says he's going to play against the Cowboys and the Giants also drafted wide receiver Sterling Shepard out of Oklahoma.